This article has been deleted by Abcnews on 10 February 2019, 19:47. We keep a copy of it on Undelete.news website available for everyone. Friday's transfer ceremony at the University of Louisiana at Lafayette is "really going to be one of the highlights of my career here," he said in a telephone interview. It's a diverse collection with about 2,000 species, said Dr. Darryl Felder, who oversaw its creation and growth over the 40 years before he retired as a biology professor in 2014. But its real value is that it has been preserved so that most of the 100,000 specimens can be used for genetic analysis, he and Lemaitre said. "It's grown to the size that only the Smithsonian has the capability to hold it and maintain this genetic sequencing ability," Felder said. The best preservative for that purpose is 95 percent drinking alcohol, which must be changed regularly so it won't turn to vinegar. Felder said he's also donating his own collection of 50,000 color photos of archived specimens. Lemaitre said those are important because they were taken while the animals were alive. "When specimens are preserved, they lose their color over time," he said. He said many of the Smithsonian's other specimens from the Gulf were taken when formalin, which damages DNA, was the most-used preservative. "Rum was used extensively in the 1800s before formaldehyde," Felder said. "Some of the oldest specimens are gene-sequenceable if it they changed it enough." Many of the specimens were new to science when collected. The collection's new location in Washington's Maryland suburbs will be handy for consultation if a federal agency needs to check the origin of suspect seafood, Felder said. Genetic analysis also is used for environmental studies, and for tracing the evolution of a species or group of species, Lemaitre said. Scientists log when and where each specimen was found. "It's like having a long memory in both space and time," Lemaitre said. 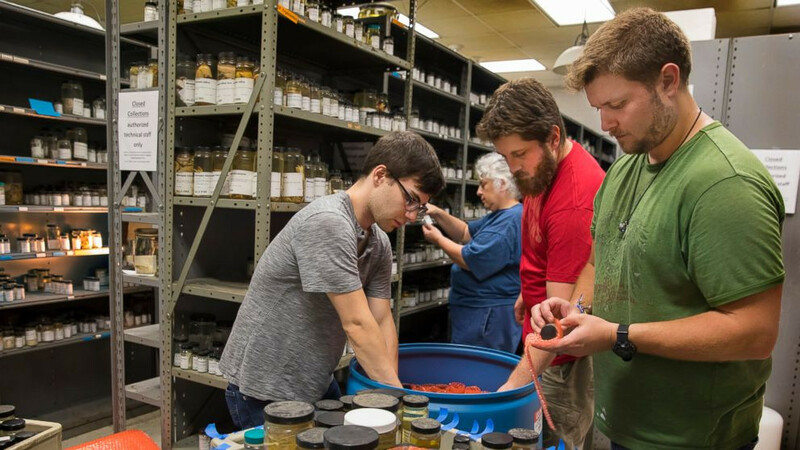 The university's database is compatible with the Smithsonian's, so students and faculty will still be able to get to everything known about each specimen, Felder said. "Not just it, but the millions of other specimens that have accumulated there for more than 100 years," he added. Felder said the Smithsonian is paying for the move, "but it did take some honest meetings ... here on campus: What's the best thing for science?" "I am proud of my institution for understanding the need for this to move on," he said. Lemaitre said he doesn't know how much the move will cost. "I think we're going to be able to do it in three trips over eight months," he said. Six Smithsonian staffers were packing the first batch up this week, he said. "You think, 'A little jar with a dead specimen is not worth very much.' But actually it's worth its weight in gold and much more, because collecting it cost a lot of money," Lemaitre said.